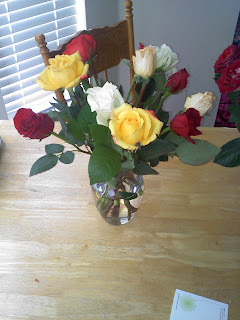 So my wonderful cousin Lara and her beautiful daughter Devon sent me these beautiful Roses yesterday! She was just wish me congratulations on the pregnancy. We come from a LARGE group of cousins but her dad and my dad are the 2 youngest kids so we are close compared to the large group that are a lot older then us. With that I am the 2nd of the 6 of us to be pregnant (she was the first LOL) so her family is just as excited for me as my family. This night sickness is not fun at all. Last night was a really bad night. I took a phenergren and slept for 11hrs.. Yeah that was a long night LOL ! Oh and I haven't had hot water since Friday and that finally got fixed yesterday too. It was nice to have a long warm shower. Pretty flowers! Congrats on the 8 week mark! Thanks for the colace recommend, I think it is going to save my life. And congrats on 8 weeks, I am so happy for you!